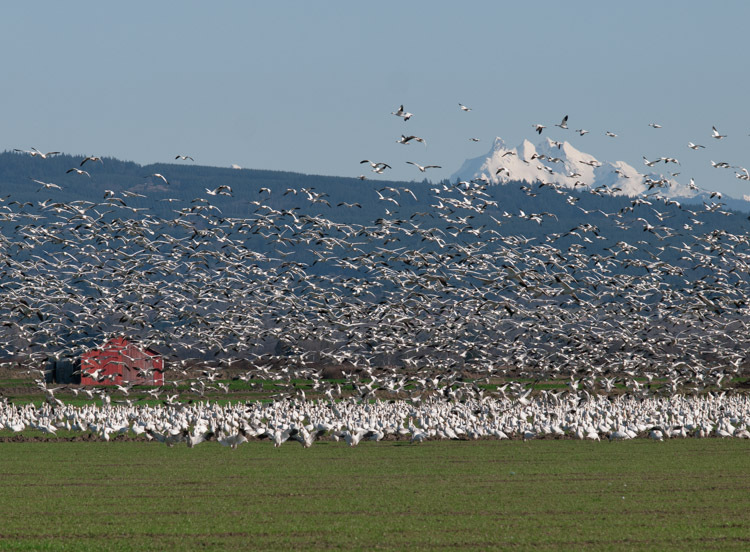 This photo series shows the calm before the Snow Goose storm … and the ripple effect that sends thousands of geese into the air within seconds, at just the slightest provocation. 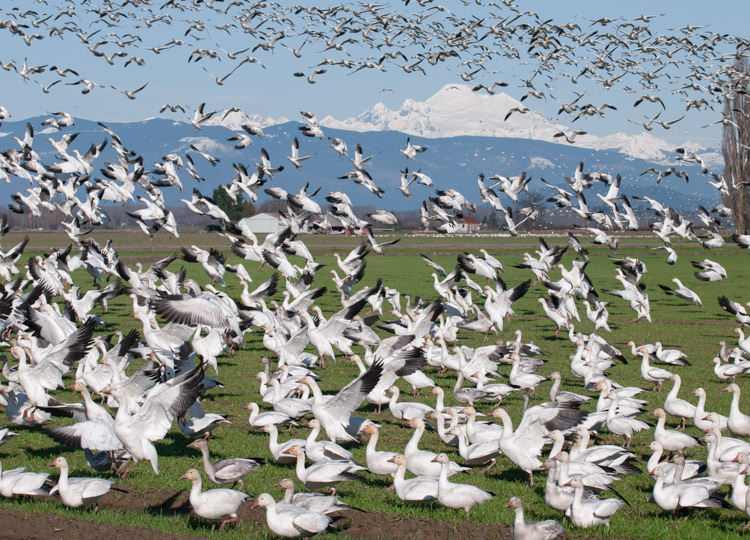 They may call out, sending audio waves through the flock before erupting into goose mayhem. Or, they may fall unexpectedly silent for a split second before bursting into winged turbulence. 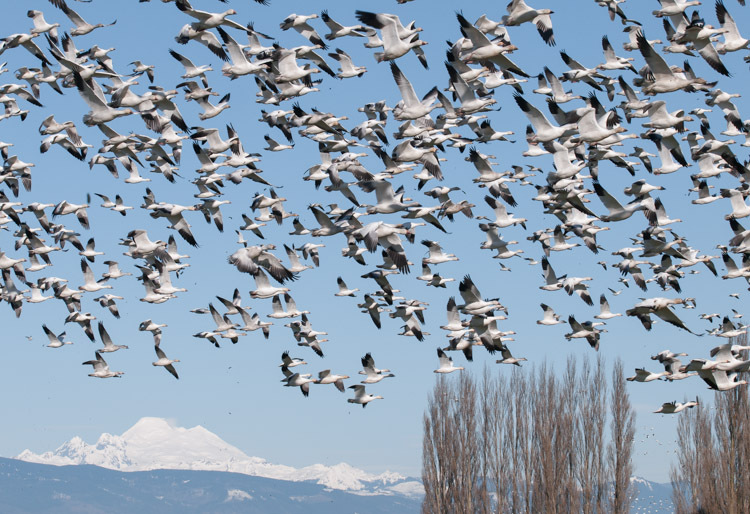 The inciting incident can be a small plane overhead, a stalking eagle, shotgun fire, or even a car door slamming that jolts the flock into sudden flight. I almost made that bad mistake on my last photo shoot — the car door slam. I have a “soft close” system of nudging the door shut without much sound, but I accidentally shoved the door harder than anticipated. 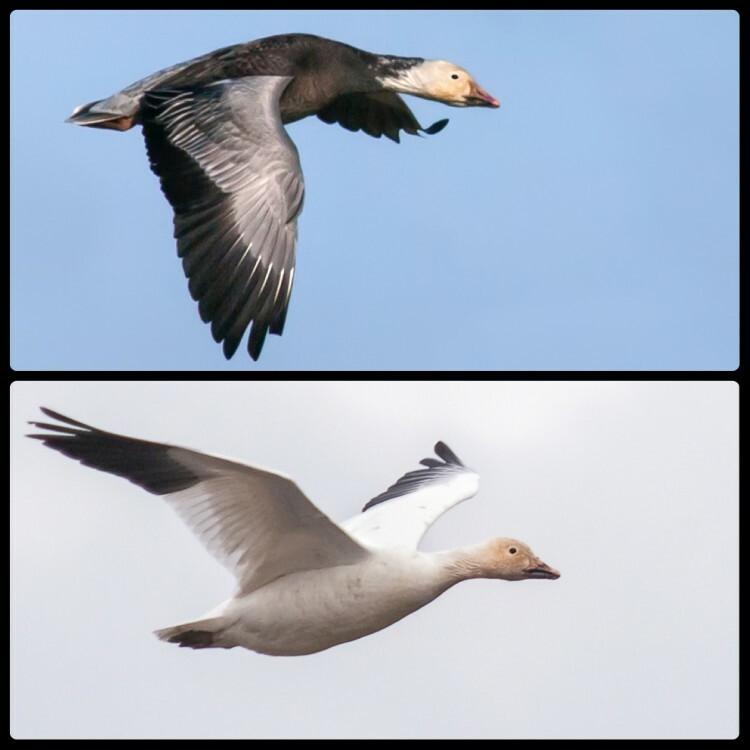 The geese in front of me fluttered upward (as pictured in the fourth shot below) — and I had a nightmarish vision of sending them into the sky to squander their energy, while I simultaneously pissed off every photographer and birder within a five mile radius. I rehearsed my apologies and shoveled my dignity into the mud. But, there was mercy. The geese realized quickly I was just another photographer and they fluttered back to business as usual, rooting out tubers in the field. 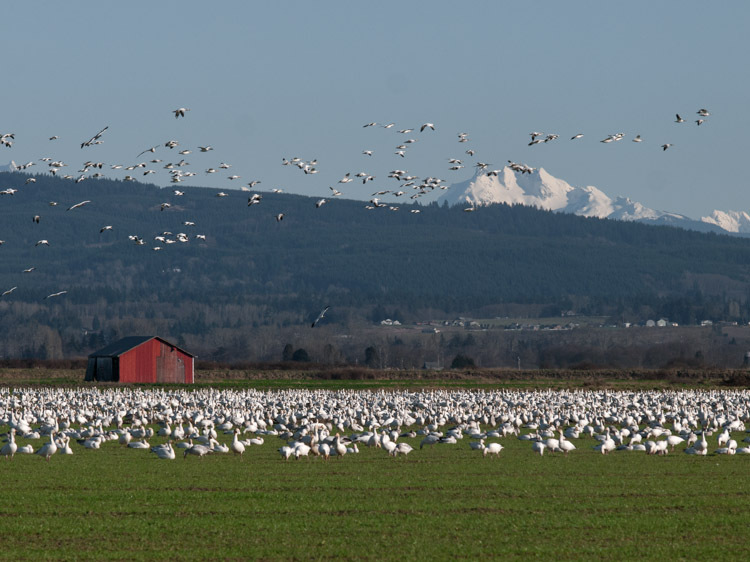 In this first image — not inspired by a car door — an warning goes off in the back field, as rows of Snow Geese rise against Mount Baker. More geese take to flight, while the geese nearest my camera raise their heads to see what’s up. 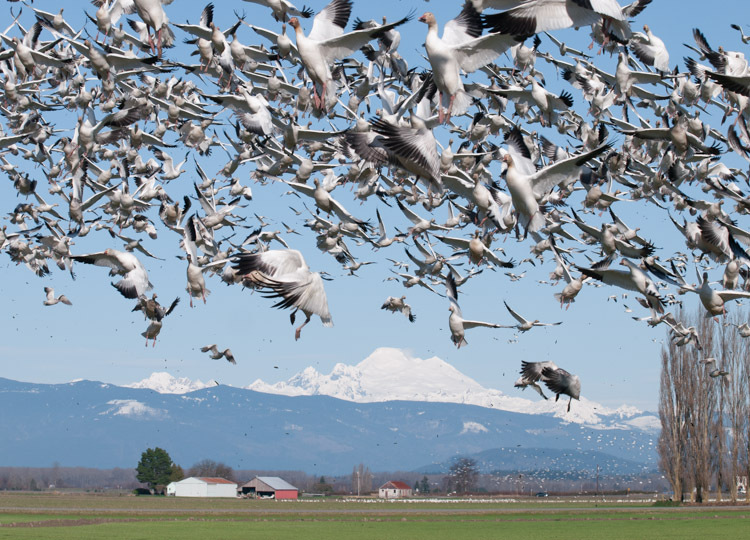 This next moment of geese flushing into the sky is more instantaneous than it appears here. In fact, it happens so quickly, you can miss takeoff if you’re not expecting it. 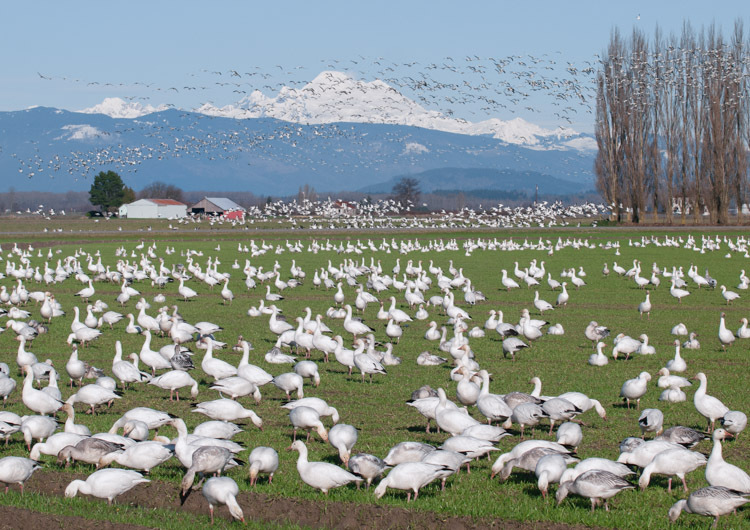 After a quick redirection and loop, the geese move to a new field. They settle against the mountains to the east, many yards now from where I stand with my camera. 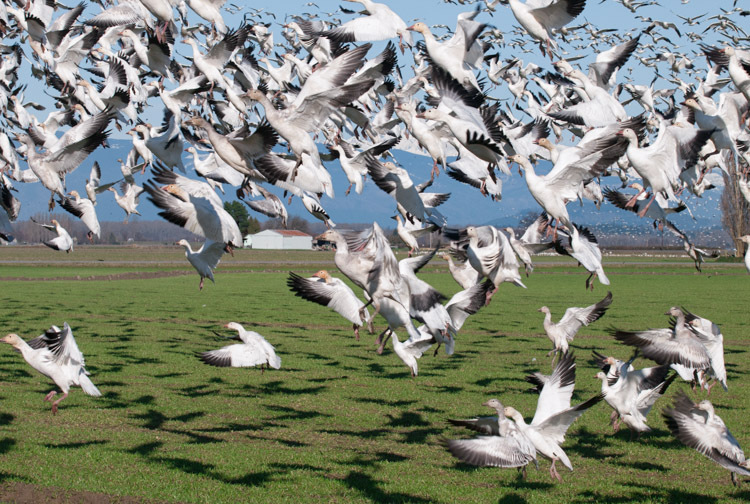 In this flock, I notice two blue morph geese, one of which I manage to capture in the distance as she takes flight. This mini collage shows the different plumage patterns of the blue morph and the white. The price of witnessing this spectacle … no, actually, this miracle of execution … is a trip to the car wash. To date, I’ve had no Snow Goose droppings on the head, hair or coat. 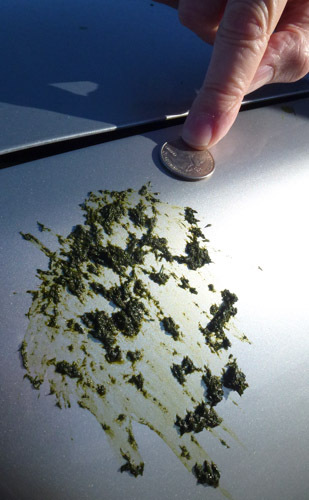 But, the last Snow Goose blast I experienced stippled the car so thoroughly in green muck, I almost retired the Honda to MOMA. I’m so very jealous, Ingrid – this is something I’ve still never seen (or heard). We have a similar extravaganza with them every year down by Delta, Utah but I’ve only made the trip once and missed the spectacle. Those shots with Mt. Baker in the background are simply wonderful. What I like about these is the great depth-of-field, from foreground to background, and the sequencing and timing as they gradually take off. The Goose Stippling for the MOMA is brilliant. Thank you, Maria. On this particular day, as I mentioned to Ron, I could shoot with a smaller aperture. The previous time I was up there was so dim in terms of light, the best I could muster was f8. It does help. CQ, they hop from field to field in this area, grubbing for tubers or eating foods leftover from harvest (waste grains, etc). 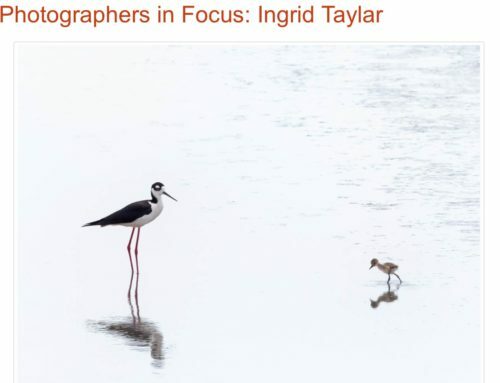 They also forage in similar ways in wetland areas. They eat many parts of plants, meaning they are very effective at finding their food. 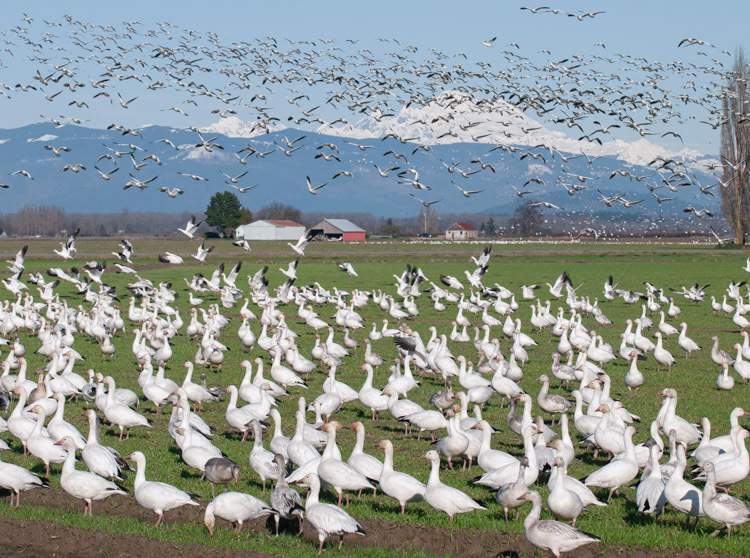 I don’t know if all of the geese are well-fed before returning north, considering how huge the flocks are. Agricultural land now provides them with ample food sources, one of many reasons why their population is increasing. Absolutely amazing! You named it right as a “miracle” of execution! And the “presents” that the geese left? Small, small price to pay to witness such a sight! Wow!